April 4, 2019 by Margaret Power, Ph.D. When we first started talking to Historians for Peace and Justice about sharing their thoughts with DSA Weekly, we had little idea that this very week, the U.S. president would be trash-talking the entire island of Puerto Rico and catapulting it into front-page news. We were thus triply glad that this essay was on its way, to help us all act and think with understanding of the issues. What’s below is slightly abridged; you can order it here, one of the group’s Broadsides for the Trump Era , as a full, designed pamphlet to copy and distribute at will. Let us know what you think! — Ed. In 1898 the U.S. military invaded and seized Puerto Rico and Cuba during the Spanish-American War. Unlike Cuba, Puerto Rico has not yet achieved independence and the United States continues to exert political, economic, judicial, and military control over the Island. Two early twentieth-century decisions defined U.S. policies toward Puerto Rico. First, in 1901 the U.S. Supreme Court ruled that “Porto Rico is a territory appurtenant and belonging to the United States, but not a part of the United States.” More than one hundred years since that ruling, the fundamental legal relationship remains the same: Puerto Rico is a U.S. territory and lacks sovereignty. Second, in 1917 the U.S. Congress unilaterally decreed that Puerto Ricans were U.S. citizens – well, sort of. Unlike other U.S. citizens, Puerto Ricans who live in Puerto Rico cannot vote in any federal election, but can if they reside in the United States. Although they have a Residential Commissioner in the U.S. Congress, s/he has no voting power. And Puerto Ricans were drafted to serve in the U.S. military wherever they lived! In 1952 Puerto Ricans voted to become a U.S. Commonwealth or Free Associated State. Puerto Rico obtained a minimal increase in local governance, including an elected governor, but ultimate power remained in Washington. The 1952 change gave the United States cover to dismiss accusations it was a colonial power at the time it was proclaiming itself leader of the Free World, and waging a Cold War with the Soviet Union for the hearts and minds of non-aligned, developing nations. Puerto Rico sits astride the Mona Strait, one of the key maritime entry and exit points in the Caribbean. Military control of Puerto Rico has offered the United States access to trade and commerce throughout the Carib- bean region and guarded shipping routes to and from the Panama Canal. During World War II the U.S. Navy built the massive Roosevelt Roads base, which until 2004 included the island of Vieques and housed the U.S. Naval Forces Southern Command. The U.S. Navy took over two-thirds of Vieques, squeezing the residents into the middle third. It used the island to train U.S. as well as NATO troops in tropical warfare and to launch attacks against Guatemala (1954), Cuba (the Bay of Pigs, 1961), the Dominican Republic (1965), and Grenada (1983). The Puerto Rican economy has generated enormous profits for U.S. investors, absentee landowners, and manufacturers. In the first half of the twentieth century, agricultural products, primarily sugar, dominated the economy. U.S. sugar companies monopolized the land, forcing small landowners and peasants to work on their estates or migrate to towns or the United States in search of work. By 1928, U.S. capital dominated the Puerto Rican economy and U.S. investors owned over a quarter of Puerto Rico’s wealth. By the early 1950s, manufacturing replaced agriculture as the primary source of profits for U.S. corporations. In the 1960s, pro-independence forces reorganized. Energized by the Cuban Revolution, protests against the war in Vietnam, and other global anti-colonial struggles, the movement embraced Marxism and included Puerto Ricans on the Island and in the United States. During the 1960s and 1970s armed clandes- tine organizations in Puerto Rico and the United States carried out bombings demand- ing an end to U.S. colonialism, freedom for Puerto Rican political prisoners, and that the U.S. Navy leave Vieques. Like most movements of the 1960s and 70s, the independence movement waned. But working with a broad section of the Puerto Rican population, it did force the Navy to leave Vieques in 2004, and secured the release of all Puerto Rican political prisoners. Puerto Ricans resist U.S. colonialism on a daily basis. They continue to speak Spanish, see themselves as part of Latin America, practice their cultural traditions, such as el Día de los Reyes (Three Kings Day); and send their own team to the Olympics. Neither of the two largest parties supports independence. The Partido Nuevo Progresista (New Progressive Party) supports statehood, while the Partido Popular Democrático (Popular Democratic Party) supports the Free Associated State. Several factors tie Puerto Ricans to the United States. Currently 5 million Puerto Ricans live on the mainland, with only 3.6 million on the Island. Families benefit from the ability to travel back and forth. Many Puerto Ricans have served in the U.S. military or worked in some branch of the U.S. government and do not want to lose their pensions, which, they fear, could happen as a result of independence. Other Puerto Ricans rely on U.S. welfare. U.S. policy toward the Island has also ravaged the economy. In 2016 the U.S. Congress passed the PROMESA law, which created a legal framework to deal with Puerto Rico’s massive debt of more than $70 billion. The oversight board consists of Wall Street fi- nanciers whose plan includes converting much of Puerto Rico’s beautiful coastline into tourist spots or homes for wealthy North Americans; closing schools to “save money,” despite the protests of teachers, students, and parents; and charging high interest rates, which means more capital flowing out of Puerto Rico to the United States. Not only money is leaving Puerto Rico – so are Puerto Ricans. Tens of thousands of skilled Puerto Rican workers have migrated to the United States, leaving be- hind an older, sicker, and poorer population. It is not clear what impact the current debt crisis, the hurricanes, and the Trump administration’s disdain will have on politics in Puerto Rico. In the face of tragedy, Puerto Ricans have exhibited tremendous resourcefulness and self-reliance. As Naomi Klein discusses in The Battle for Paradise, many are trying to build their lives, communities, and nation so that they are more sustainable, more resilient in the face of climate disaster, less dependent on imports, and more reliant on the resources, skills, and riches of Puerto Rico and Puerto Ricans. Naomi Klein, The Battle for Paradise (Chicago: Haymarket Books, 2018). César J. Ayala and Rafael Bernabe, Puerto Rico in the American Century (Chapel Hill: University of North Carolina Press, 2007). “Puerto Rico: A US Colony in a Postcolonial World?,” Radical History Review Vol. 2017, Issue 128, May 2017. 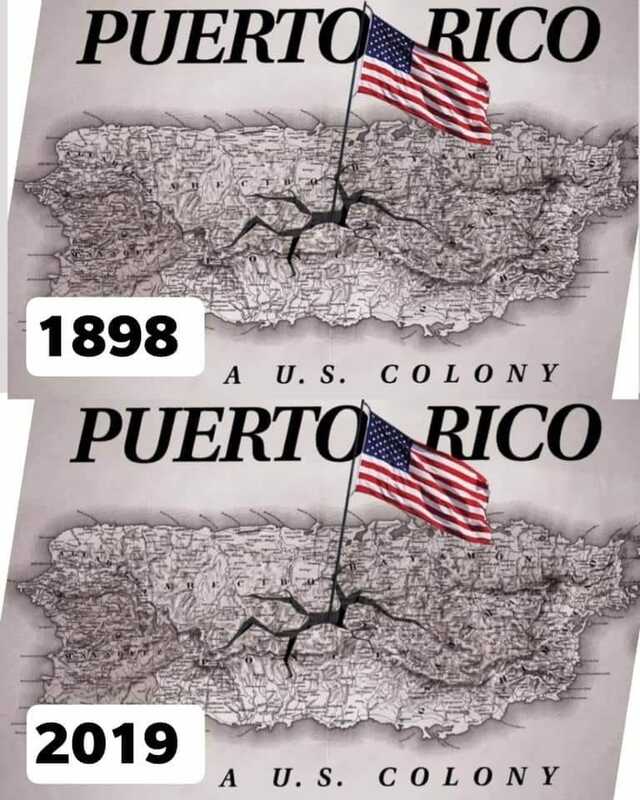 Photo thanks to the stealth Facebook page, PUERTO RICO; THE LAST COLONY. Margaret Power is a professor of history who focuses on Latin America, women, and gender. Her earlier work explored why a large number of Chilean women opposed the socialist government of Salvador Allende (1970-73) and supported the military dictatorship of Augusto Pinochet (1973-1990). She also explored various expressions of the global and transnational Right. Currently, she is working on two projects. One focuses on Norvelt, a New Deal community in southwest Pennsylvania named for Eleanor Roosevelt. The other one examines the Puerto Rican Nationalist Party, the political organization that led the struggle for independence from the 1920s to the 1950s.